Melodic stories full of heart and passion. Natasha Pearson is a composer and songwriter based in Melbourne, Australia. She tells melodic stories inspired by philosophy, myths, nature and politics. Born in Canberra, Natasha moved to Melbourne to study a Bachelor of Music Composition at Sir Zelman Cowen School of Music, Monash University. 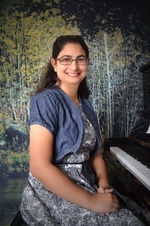 Natasha's music has been performed by a wide variety of ensembles including Ensemble Goldentree, Grainger Wind Symphony, Ensemble Phorminx and PLEXUS. Her works have also featured in new musicals and chamber ensemble concerts both locally and internationally. In 2016 Natasha released her debut album New Leaf, an eclectic jazz pop collection of songs drawing on influences from Ella Fitzgerald, Sara Bareilles and Alan Menken. It has been played on 50 different radio stations across Australia, was selected for album of the week on Fusion City 2MIA FM, and featured by Carol Lucas on 2BOB Radio's Under the Australian Covers. A review by missmaestromusic can be found here. Natasha's The Song of Us was originally commissioned by Ensemble Goldentree and now features as theme music in Beyond The Stage, a podcast curated and hosted by Susan De Weger with 3MBS Fine Music - Melbourne and producer Penny Manwaring-Thomas. Since 2017 Natasha has devoted her time to working on a new Australian musical, Ace of Hearts; a story which challenges societal expectations of heteronormal relationships. The work is still in progress with aims to showcase in 2019. The Song of Us : soprano with ensemble (2016) Commissioned by Ensemble Goldentree. On the Brink (quartets: 4 flutes) (2014) Commissioned by Effervescent Flute Quartet.